A fly-by diner right out of the past! Just east of downtown Spokane the Skyway Café is an un-pretentious little diner perched right on the side of the runway at the historic old Felts Field airport. A favorite among local pilots, old flying cronies and anyone looking for a substantial breakfast to start the day, the Skyway is part of Spokane airplane history. 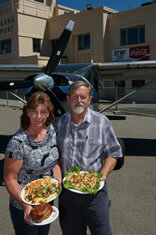 The little café dates back to 1921 when it was an integral part of food service at the region’s major airport. Felt’s Field with its art deco airplane terminal was Spokane’s municipal airport in the 1930s to ‘40s. Northwest and United Airlines flights crowded the runway and the airport buzzed. After World War II the commercial fights moved to Geiger Field which then became Spokane’s new main international airport. The Skyway stayed just where it has always been and now services with pride all the airplane charter services, flight schools and the multitude of small private planes that buzz in and out of Felt’s on a daily basis. These provide constantly changing flight entertainment right outside the café windows. 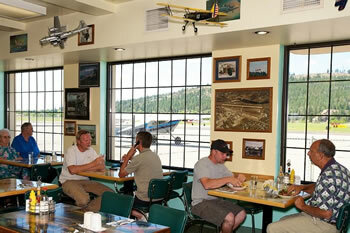 Inside, the Skyway Café is airplane memorabilia central! 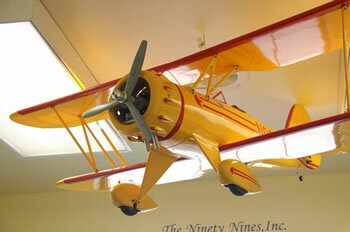 Model airplanes hang everywhere and the walls are lined with airplane and flying pictures. But it’s the food that people come for! Breakfasts are amble, just like the good old days, and the menu includes every breakfast item imaginable. If you just flew in from the outback and are as famished as a hungry moose, then go ahead and just try and eat the full order of chicken fried steak! Almost a foot long and 6’ wide, the steak n’ gravy are large enough let alone the 2 eggs, hash browns and toast nestled along side! For lunch you have a choice of a number of different hot and cold sandwiches and good old standards like fish & chips, French Dips, meatloaf and liver n’ onions. For the burger lover there are at least 10 variations on this all American fare. Speaking of all American… save room for pie! Made fresh daily from scratch, even mom would find these to be a sky high delight! It’s a great place to take friends who want to experience a taste of historic airplane nostalgia or a place to entertain kids with flying dreams. 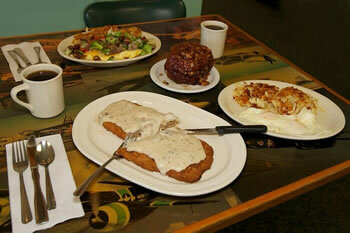 The Skyway Café is a diner delight for the flight minded and a tummy filler for the rest.